Demonstrators target police vehicles and state offices as they defy curfew and stay on the streets of Cairo. 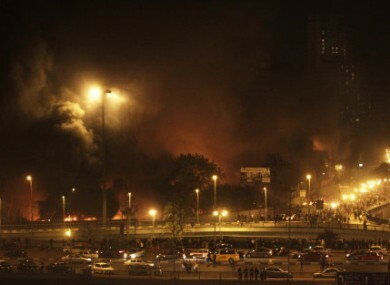 Fires from burning buildings are seen at night on the Corniche, an area of the city taken over by anti-government protesters, in downtown Cairo, Egypt. this evening. PROTESTERS IN CAIRO IGNORED today’s curfew and continued to demonstrate on the streets against President Mubarak after darkness fell. Al Jazeera has been showing live footage of angry crowds setting vehicles alight and attempting to push an abandoned police van into the River Nile. The headquarters of the ruling party were set alight by protesters earlier this evening. “Police appear to be absent from key areas in Cairo”, Al Jazeera reported tonight. Amin Iskandar of the opposition Al Karama Party told Al Jazeera that he felt victory against Mubarak’s “regime” was coming and he predicted that those involved in that regime would have to face trial for corruption during their tenure. Yesterday there were widespread reports of disruptions to internet service in cities across Egypt. US Secretary of State Hillary Clinton said the US urges “the Egyptian authorities to allow peaceful protests” and to reverse the steps it’s taken to cut off communications. She said: “Violence will not make these grievances go away. As President Obama said yesterday, reform is absolutely critical to the well-being of Egypt”. The EU’s High Representative Catherine Ashton condemned the violence and yesterday extended her sympathies to the families and friends of the people who had been reported killed in the demonstrations. At least four people were reported to have been killed yesterday. Reuters reports this evening that 410 people have been injured today, with a number of people in serious condition after receiving gunshot wounds. Other reports suggest that up to 800 people were injured today. Email “410 injured in continuing Cairo protests (Video, Photos) ”. Feedback on “410 injured in continuing Cairo protests (Video, Photos) ”.